As part of KPI's web series on Examining Oracle BI Applications 11g, Myles Gilsenen examines what is new in the Budgetary Control area Oracle's Financial Analytics 11.1.1.7.1. As part of KPI's web series on Examining Oracle BI Applications 11g, Myles Gilsenen examines what is new in the Employee Expenses area Oracle's Financial Analytics 11.1.1.7.1. The Oracle Data Integrator platform integrates into the broader Fusion Middleware platform and becomes a key component of this stack. 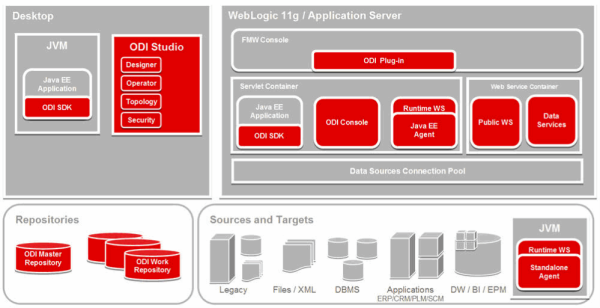 Oracle Data Integrator provides it's run-time components as Java EE applications, enhanced to fully leverage the capabilities of the Oracle WebLogic Application Server. Oracle Data Integrator components include the FMW exclusive features for Enterprise-Scale Deployments, high availability, scalability, and hardened security. This blog introduces and explains the detailed step by step process for executing the Data Load to Business Analytics Warehouse. Here, we are illustrating for the Student information Analytics data using the new OBIA 11g which is supported only for PeopleSoft 9.0 Campus Solutions. This blog introduces and explains the detailed step by step process for executing the Domain Load to Business Analytics Warehouse. Here, we are illustrating for the Student information Analytics data using the new OBIA 11g which is supported only for PeopleSoft 9.0 Campus Solutions. This blog can be used similarly for any other Analytics using OBIA 11g.